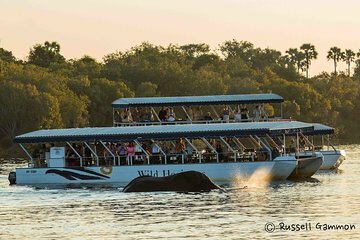 Snack, sip, and sightsee while watching the sunset on this Zambezi River cruise from Victoria Falls. Light refreshments and a wide selection of alcoholic beverages and soft drinks keep you refreshed as you search for animals like crocodiles, birds, and hippos in the wild. This tour also includes hotel pickup and drop-off from Victoria Falls for seamless transportation. Winter: 1st May to 31st July – departs at 16.00 returns at 18.00.